I don’t often use a post just to showcase a video, but occasionally I see one I simply must share. It wasn’t that widely circulated in the general media, but if you’re a SPACE.com fan you might have caught it. I also don’t normally set my videos to loop, but this one just works better that way. The video was assembled from over 20 years of images taken by NASA satellites, including SeaWiFS (Sea-viewing Wide Field-of-view Sensor) which was launched in 1997, and the weather satellites Terra, Aqua and Suomi NPP. Individual frames were combined into this time lapse video showing how Earth’s appearance changes through the cycle of seasons. Some of the changing features are obvious, like the snow advancing and retreating from the Arctic, and the waxing and waning of the Antarctic ice sheet. Vegetation is shown in colors ranging from brown (little vegetation) to dark green (lush forests). 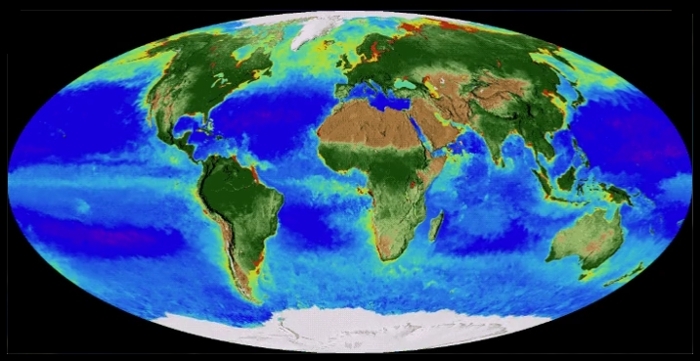 In the oceans, phytoplankton are shown in colors ranging from purple (below normal concentrations) to blue→yellow→red (highest concentrations). Everyone knows that trees (and other flora) “inhale” carbon dioxide and “exhaust” the oxygen we breath. Not so well known is that phytoplankton, a microscopic form of algae found in the oceans, do exactly the same. Most species are buoyant and stay near the surface to absorb more sunlight, so they are easily imaged by satellites. Scientists estimate that phytoplankton produce anywhere from 50–85% of our planet’s oxygen with the rest coming from plants on land. So this video shows, in a very real sense, Earth breathing — responding to the seasons as well as to prevailing winds and ocean currents. I’ve been an environmentalist most of my life, and I’ve never been a subscriber to the literal Gaia Hypothesis, and I didn’t really learn anything new by watching this video, but … the visual impact of seeing all these living (and non-living) systems operating in synchrony added, for me, yet another layer of reality to R. Buckminster Fuller’s metaphor of Spaceship Earth.